The new summer term at Turney School has got off to a great start with all pupils being presented with an achievement certificate to recognise their individual effort. Each Monday morning Miss Handa holds an Achievement Assembly. This is an opportunity for the secondary school students to share in their successes. Colour coded certificates are awarded based on the attendance and behaviour record over the previous week. As the first week of the summer term was a shortened week, all pupils were proudly awarded a Turney School red certificate. We are hopeful of a full house of blue certificates next week, meaning that all students have had a wonderful five days of learning. Miss Handa spoke in the assembly about what it means to achieve this high standard of learning. It is something that all Turney students should feel proud of, as well as always looking ahead to improve with our learning. The extra special award is the Class of the Week. Each Monday morning the teaching staff decide collectively which class has made an outstanding effort over the previous week. 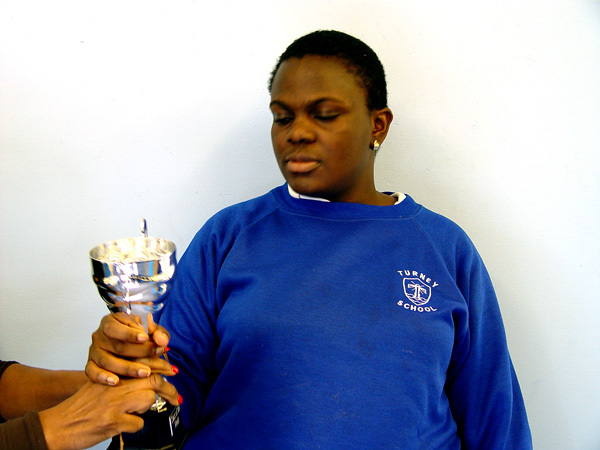 Class 1G was awarded the trophy on this occasion. The Achievement Assembly was brought to a close with the singing of the Turney School Song, and then a reminder from Miss Handa of the main Turney School rules that help to make the school a happy place to learn for all students.